This peanut butter frosting is thick, creamy & filled with peanut butter goodness. It’s an easy buttercream recipe that’s perfect for cupcakes, brownies, birthday cake or anything that goes with peanut butter! This peanut butter buttercream frosting just might be my all-time favorite thing. (Sorry boyfriend). Creamy, fluffy, salty sweet, peanut buttery goodness. Seriously – it’s like the center of a peanut butter cup in fluffy, frosting form. Or like peanut butter flavored soft serve ice cream. Lately I’ve been trying to expand the frosting section on Just So Tasty. If you have a classic vanilla cupcake recipe and a classic chocolate cupcake recipe – you can mix and match your frostings to make just about anything. Like how your wardrobe only needs one perfect pair of jeans, then endless tops. Know what I mean? So a perfect peanut butter frosting recipe has been on my to-do list for a while. To make the frosting – we first beat together softened butter and peanut butter until it’s no longer lumpy. Then we mix in sifted powdered sugar, a little vanilla extract & cream or milk. Super easy, nothing fancy – just creamy, fluffy, pipe-able peanut butter goodness. For the perfect recipe, I experimented quite a bit with the ratio of butter to peanut butter. Too much butter, and your frosting isn’t peanut buttery enough. Too much peanut butter, and it’s no longer perfectly pipe-able. I found the perfect ration of butter to peanut butter was 1:2. For this peanut butter frosting recipe – you can use cream or milk (really any variety between whipping cream all the way to 1% milk). Whipping cream makes the buttercream thicker and fluffier, whereas if you use milk it’ll be a little thinner. Both work – but if you’re planning to frost cupcakes using a piping bag I’d recommend whipping cream. Can I use salted butter? Yes, but I’d definitely remove the salt from the recipe. Can I use natural peanut butter to make the frosting? I don’t recommend it. Natural peanut butter can separate and cause the frosting to get oily or also separate. How do I make the frosting ahead of time? 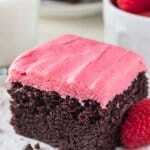 You can make the frosting a day or two in advance and store it in an airtight container in the fridge. Take it out of the fridge to soften about 1-2 hours before you want to frost your cake or cupcakes. If it isn’t quite soft enough yet, you can beat it again with your electric mixer. 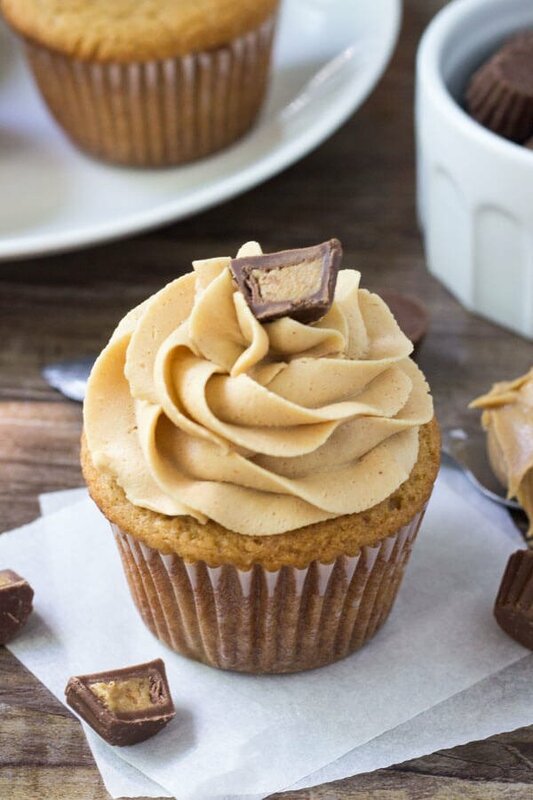 This peanut butter buttercream is so delicious on chocolate cupcakes, brownies, birthday cake, or just about anything that you eat for dessert. I love the combo of salty, sweet, peanut butter goodness – and if you’re a frosting addict like me, then you definitely need to add this peanut butter buttercream to your baking to-do list! 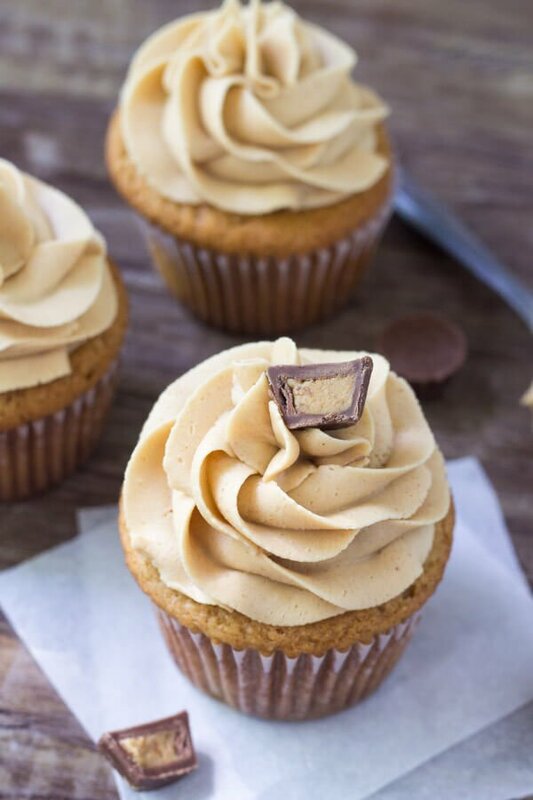 Fluffy, creamy peanut butter buttercream. This easy frosting recipe is perfect for cupcakes, brownies, birthday cake or anything that goes with peanut butter! Beat in 2 cups of the powdered sugar and vanilla extract. Beat in the remaining powdered sugar 1/2 cup at a time, alternating with a tablespoon of the cream until the desired consistency and sweetness is reached. *Makes enough for 18 cupcakes frosted with a piping bag, or 24 cupcakes if frosting with a knife. Or one 9x13 inch cake. Looks like the perfect peanut butter frosting! !